This stunning book includes more than two hundred color and black-and-white reproductions of masks, ceremonial figures, musical instruments, and objects of everyday life from throughout Africa. Among the jewels in the museum are the Ife Collection from Nigeria; rare Benin bronzes; Afro-Portuguese ivories; magical figures from the Lower Congo and a host of East African sculpture and masks that have gained increasing attention in recent years. 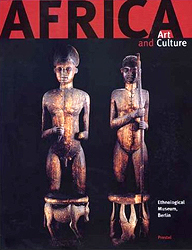 Essays by leading ethnologists supply important cultural and historical information on each region, as well as fascinating insights into the ways European and African art have traded influences over the centuries.